When you think of NASA, what comes to mind? NASA is always creating new and never seen before products to benefit space expedition. However, the technology created by the genius’ at NASA, is often then repurposed and reimagined for use back on earth. So actually, when you think of small, battery-friendly cameras incorporated into mobile phones and HD video found in products like Go-Pros, or VR headsets, you should think of the agency since NASA invented these products. 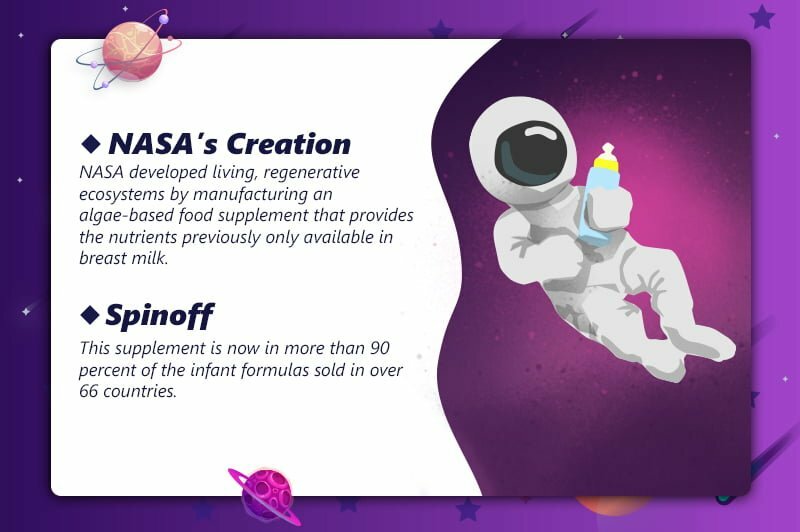 Food and Nutrition For Babies: In order to address basic needs of crews, NASA developed living, regenerative ecosystems that would take of themselves and their inhabitants. NASA used a method for manufacturing an algae-based food supplement that provides the nutrients previously only available in breast milk. This supplement is now in over 90% of the infant formulas sold in over 66 countries. 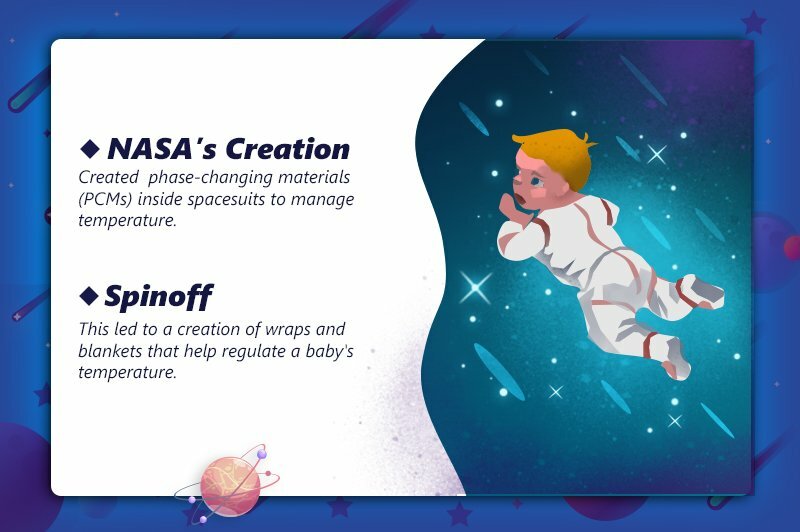 Temperature-Regulating Fabrics For Babies: NASA created phase-changing materials (PCM) inside spacesuits to manage temperature – this led to the creation of fabrics incorporating PCMs, such as blankets and wrap to help keep babies stay at an optimal temperature. 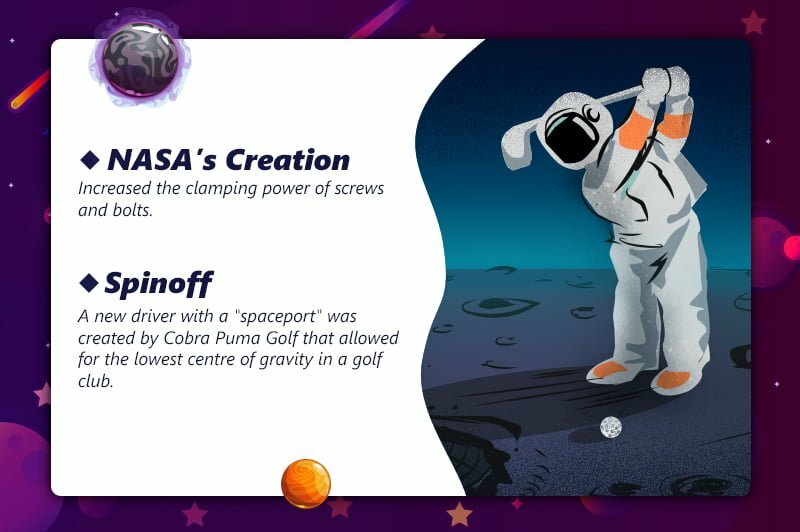 Spaceport In Cobra Puma Golf Drives: An invention which increased the clamping power of screws and bolts was discovered, enabling them to survive repeated shuttle launches. Following this, a new driver head that included a ‘spaceport’ using this technology, which allowed for the lowest centre of gravity ever achieved in a golf club. 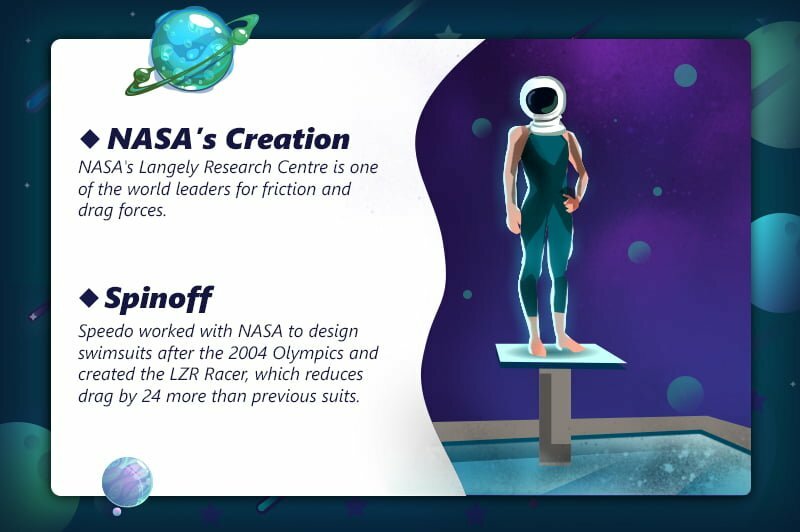 Record Breaking Swimsuits: Due to NASA’s Langley Research Centre’s experience in studying the forces of friction and drag, swimming giants Speedo asked the agency to help design a swimsuit shortly after the 2004 Olympics. The LZR Racer reduces skin friction drag 24 per cent more than the previous Speedo racing suit. The research seems to have paid off; in March 2008, athletes wearing the LZR Racer broke 13 world records. 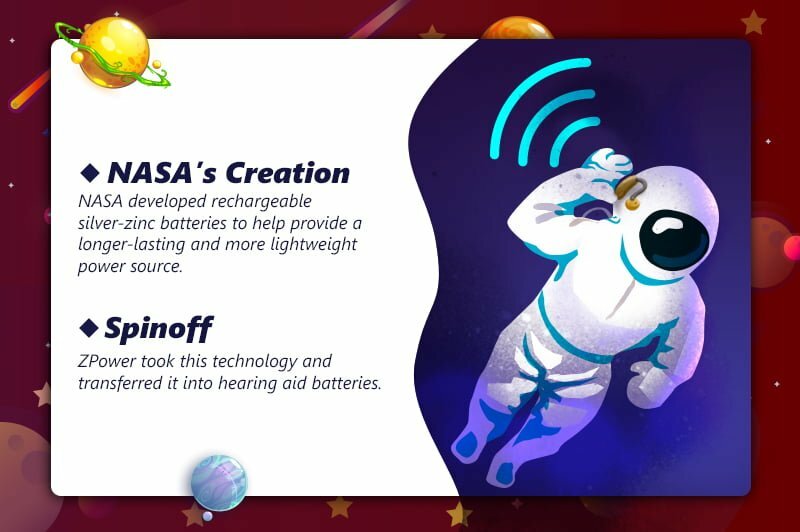 Hearing Aid Batteries: NASA developed rechargeable silver-zinc batteries, as the pairing offers a higher power-to-weight ratio than any other battery couple. Glenn Research Center then advanced the batteries’ durability. ZPower of Camarillo, California, undertook years of additional development before releasing its rechargeable hearing aid batteries, the first that can last all day on a single charge. 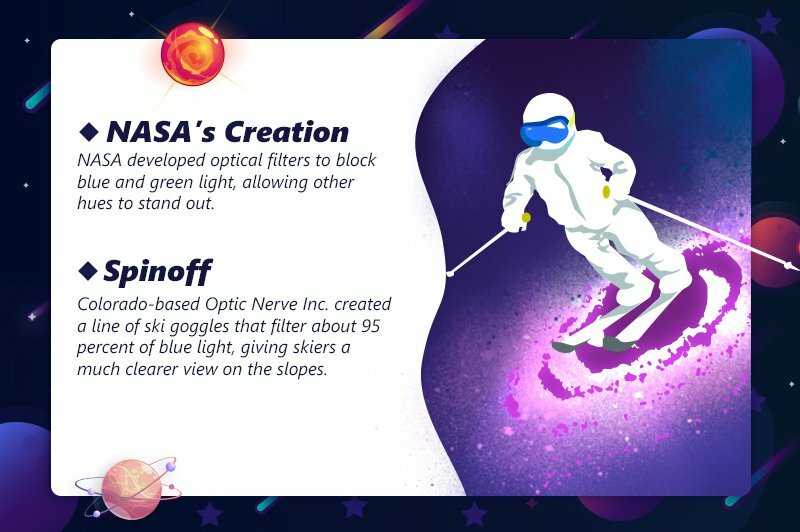 Blue Light-Cancelling Lenses: NASA developed optical filters to block blue and green light, allowing other hues to stand out – a line of ski goggles has been developed with this technology that filters about 95% of blue light, giving skiers a much clearer view on the slopes. So it seems we have more than space exploration to thank NASA for. See 10 everyday products you didn’t know NASA invented here.